← Election 2010 and Social Media: What are impacts to campaigns, results, and the future of politics? Indeed, twitter and other media to connect face a barrier of noncomprehension, much like the telephone in its time or the radio. You need to try it, best with friends, to understand basics. Then you can make an informed decision. I had my twitter account for almost a year until I connected for real. Now it is a utility. Q. Where else can you message the world and get answers? A. Nowadays, just about everywhere. Through blogs, through facebook, through Yahoo Answers, through corporate enterprise systems like Spigit, Yammer, Sharepoint and others. There are tons of different channels for messaging the world nowadays – so would be interested to hear what makes Twitter truly unique – is it the people who are on it? The messaging style? The concept of asynchronous communication has been around for years before Twitter – so what makes it different? At the same time, I’d also say that Twitter’s difference and unique behavior is also one of its biggest barriers to entry and adoption – how many other social platforms need so much time in order to become an “engaging tool” or “utility” as CoCreatr mentioned above? You need to use it, to follow, to observe, and to participate for a good while before you “get it” – common sense says that in order for adoption to be easy, the whole thing needs to be innately intuitive – and whatever else you can say about Twitter, it’s definitely not that. Hope I can make this one – but if not – would love it if you could address the above! Good set of questions for today’s chat. One challenge that Twitter has is its limited adaption. The fact is that Twitter is only used by 6% of the US population (link). Therefore as a marketer, it’s critical to build your presence across multiple platforms. Also – here’s the link to Heidi’s excellent post on Twitter Mojo. Great background material, as well as some guidelines for how to approach meaningful Twitter engagement. Hope to hear some of these ideas discussed for today’s SMCHAT Q1! Excellent input, guys. Twitter as utility would certainly carry the weight of a paradigm shift. But challenges remain. Whether or not it is yet intuitive enough, or gaining enough critical mass in the public/commercial domains, are still open question. Again we’re asking that question: How much is enough? Is there incremental benefit to be had? Or does everyone need to be on Twitter? Bernd, Boris & Heidi – Thanks so much for your feedback, guys, both there and on Twitter. Much appreciated! Just a thought to add into the mix…. I think perhaps there is a golden triangle for effective use of twitter. a) Having a good quality network that will propagate and compliment your message use of twitter – Its not really the absolute number of connections here! b) Being in touch with the issues of the moment relevant to your message and audience – serendipity! c) Stories that people want to retweet, add to and be associated with. Get these 3 aspects working in harmony and twitter and the wider social media will be invaluable to your cause. I think the major obstacle to mass-adoption – at least in the areas in which I’m active (Investment Banking, VenCap, Fortune100/500; ‘Big Business’) – is the tired old “how do we demonstrate ROI?” It’s always tricky to affect a culture shift which involves time, materials, and money, when you can’t concretely demonstrate the return. I think once good metrics that can accurately measure influence and saturation become available, you’ll see the suits jump in with both feet. That said, most corps I know are getting into anyway, albeit blindly, just so they can say they are ‘in’. Looking forward to today’s chat. Paul – Love your 3-legs on the table visual: connections, timing & story. simple and elegant, and seems to hit the most critical drivers. Ryan – Agree with your point in the context of Enterprise adoption, aka “e2.0”. ROI often raised, and often (hotly) debated in SM circles. I go back to other paradigm shifts in communication like the telephone, radio, television, email, and the internet. All of them, in their day (I hear) created confusion and distrust in the earliest stages, as people tried to figure them out. Then the value became clear, the usage became ubiquitous and utilitarian, to Bernd’s point, above. Seems we’re on the same page. Question I’m always asking – how can we move these forces forward? Or do we simply need to wait out the evolutionary process? I happened upon #smchat this afternoon, which led me to your site. I’ve been on Twitter for about 3 months, so have a lot to learn, but I can see some of the potential. I’ve subscribed–and am glad to have found your blog as a resource. So you cannot explain twitter, why try? Imagine: a hundred-or-so years ago you had used a telephone and liked it and then visited neighbors to tell them about this amaaazing new technology. How many would be getting it? Augment your rave with a spontaneous pencil drawing. How many would get it? Will he get it if you hand him the receiver and beam at him, “for you!” Will he know to say even, hello? Remember learning to ride the bicycle? What inspired you to try, despite the risks? Yes, you saw others doing it and having fun. So, how do you get A to talk on the phone to B who is invisible, yet patiently waiting to hear his friend? Would the same work on twitter? Bernd – I suppose you’re right, significant paradigm shifts take time, and yet – I still think something bigger is at work here. The technology comparison works to a point. But radio and tv were generally one way (broadcast, or 1:n) and telephone started 1:1 then eventually (years later) expanded to become 1:few. The internet basically blew the lid off of all that with global connectivity, even though the broadcast 1:n paradigm prevailed for awhile. Most call that web 1.0. When bi-directional communication aka social media entered in, it was more like n:n. That’s web 2.0. Now you can do fundamentally different things. It’s really a different set of capabilities now. People talking with and working with other people, around the world. What if we compared it with transportation? The horse, the train, the automobile. All were successively more efficient ways for a person to cover distance over land. But the concept of the transporter on Star Trek (or ‘Wonka Vision’ for the faithful?) fundamentally redefined what transportation meant. The rules changed. At least in the hypothetical imaginings of science fiction. Global interconnectivity (the web) and global collaboration (Twitter) are now real, and like the transporter on Star Trek, the rules have changed. Just imagine if we all learned the potential of global collaboration, and learned how to leverage it? I think A would have plenty to say. “Give me that thing” A would shout, “I owe B some feedback, and I’m late for a conversation with C, D and E”. Yes, n:n connections as in an “open space” unconference enable new forms of collaboration and performance. I attribute the biggest effects to goodwill, transparency, and trust-building. It is like texting/SMS but mostly in public. Try it to see if it helps you any. If not familiar with texting, chat or forum, I mean mechanics and etiquette, expect a challenging learning curve. Chris and Bernd, you guys both make great points. I think the underlying disparity between your points of view is the matter of whether the people in question understand the value of the potential benefits. We can imagine the slightly adventurous type whose desire to speak to his friend might override his confusion and skepticism. We can also imagine the cautious type who asks why he would need to talk to his friend when he just wrote him a letter last week. I think the same actually goes for the transporter example. It is easy to grasp that value of a transporter once you have cars and planes and broadcast media. But put yourself back in time another hundred years or so. For someone who never expects to leave the town he was born in a transporter would be utterly baffling. Why would you need a transporter when you can just walk to the corner store? Greg – thanks for drawing out the connection across threads. I tapped the science fiction ‘transporter’ example because of the well known linkage between Star Trek’s 1960’s flip out communicators and the modern cell phone. But I especially like your corner store example because it is a local one. The horse and car fine for the corner store, not to mention bicycles or walking. But those modes of transportation are severely limited. Global connectivity was, by definition, impossible until the 20th century (telephone, radio). Ubiquitous connections around the world came in with the internet, still more recently (commercially, 1990’s). And n:n conversation anywhere in the world,? Twitter, 2006. Of course, conceptually, this is ‘vintage’ Friedman (The World is Flat). 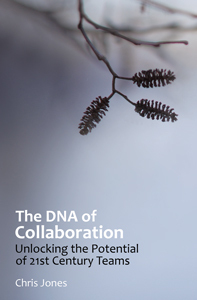 For a more rigorous treatment of global collaboration capabilities, see Tapscott (Wikinomics). Chapters 4 and 6 both introduce online problem solving that is emerging as we speak. A great example of that would be #Ecosys, in chat wiki and framing flavors. In the end, sure, you can still walk to the corner store. If that’s the only place you want to go. You guys lead me to new ideas every time we talk. I want to comment on a tangent, about finding the ideal tool for the job, which is not always twitter. I also use an Identi.ca account – that’s an open source version of Twitter with a bunch of extra benefits, including groups, permanent records of posts, and “in context” links to show threaded conversations. Everything I post to Identi.ca automatically goes to Twitter, so it’s easy to compare the effectiveness. For me personally (@chriswaterguy) the vast majority of my interesting conversations happen on Identi.ca – because the group feature (e.g. tagging with !linux to post to the Linux group) brings more people to the conversation. I also find more intelligent comments and less fluff on Identi.ca. For our organization’s account, talking mainly about sustainability, international development, we get more responses on Twitter, simply because a lot more people are using it – first-mover advantage. So my suggestion is: if you’re working with a tight community or organization, then you’re probably best setting up accounts on Identi.ca (or another Status.net site – they can all talk to each other). You should find a lot of benefits. You can also use the software for free, if you want to use it internally in an organization. Hope you don’t mind the side-track – and I hope that some of you get some benefit from the conversations on Identi.ca. I’ve been talking about an alternate modality for years. Implementation doesn’t have nearly the traction that punditry does, and I’m sure we’ll all more/less agree that “Attention Economy” rules.